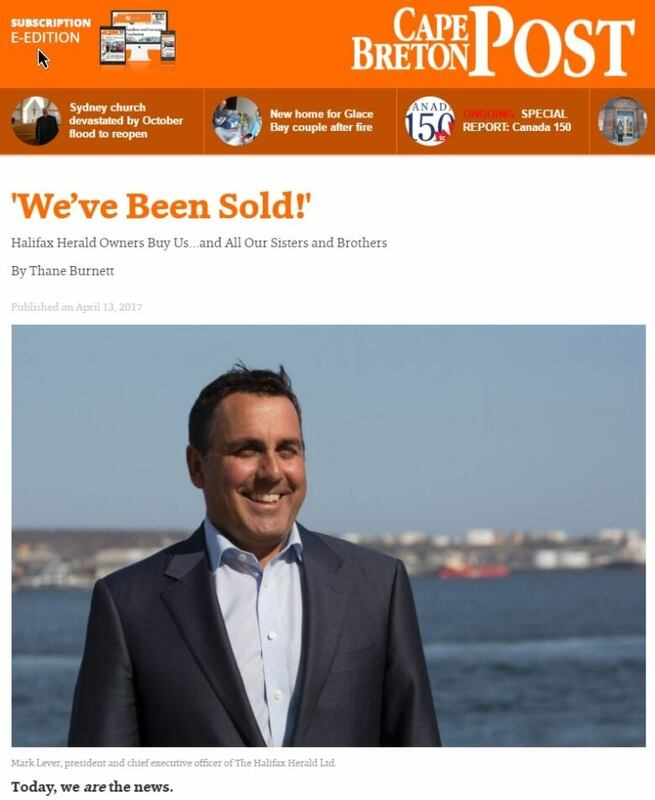 The owner of a Nova Scotia newspaper whose unionized journalists have been on strike for more than a year announced Thursday it is buying more than two dozen Atlantic Canadian papers owned by Transcontinental Inc. The Chronicle Herald, which is headquartered in Halifax and is Canada's oldest independently owned newspaper, has relied on reporters who have crossed the picket line for more than 14 months while its unionized newsroom employees have been on strike. All of Transcontinental's news outlets in Nova Scotia, New Brunswick, P.E.I., and Newfoundland and Labrador have been sold to SaltWire Network Inc., a newly created media group that publishes the Chronicle Herald. The sale includes 28 publications (including one online) on the East Coast, but Transcontinental said in the release that it will retain two printing plants in the region including the Halifax plant on Ragged Lake Boulevard and one in Borden-Carleton, P.E.I. It also said 650 Transcontinental employees are part of the transaction and will receive offers from SaltWire. According to a story posted on the Chronicle Herald website Thursday, Chronicle Herald president Mark Lever said all of those employees will be offered positions "in the same capacity with the same salary and same benefits that they have now." "Certainly today, there are no plans for cuts," said Lever. "We're really excited about the properties that we've acquired. We're going to examine each market on its own merits and each operation to make sure we have the appropriate staff complement to make it successful going forward." Since SaltWire is a private company, Lever said he's not required to and won't disclose how much the deal cost. Katherine Chartrand, director of communications for Transcontinental, said SaltWire approached the company several months ago about purchasing the newspapers. She said the papers are profitable and represent $66 million in annual revenues. Lever said while the Competition Bureau would likely look at the acquisition, he believes the deal is solid. "There is no overlap in major markets or smaller markets for that matter so we are comfortable that we meet the standard," he said. In an email to CBC News, the Competition Bureau said it could only say if a review is conducted once any details of a probe are made public. "While media ownership concentration can raise other public interest concerns, under the Competition Act, the bureau's mandate is to review mergers exclusively to determine whether they are likely to result in a substantial lessening or prevention of competition," said spokesperson Marie-France Faucher. Ingrid Bulmer, president of the Halifax Typographical Union — which represents 54 Chronicle Herald reporters, photographers, editors and support staff on strike — told CBC's Maritime Noon that the company's new purchase is contrary to a business "crying poor for 15 months, if not longer." Talks between the union and the newspaper have broken off a number of times, despite concessions offered by the striking employees. Lever has said his paper faces a crunch in a changing media landscape. Management has asked for a variety of contract changes — from wages to pensions — but the sticking point has been union jurisdiction. If anything, Bulmer said, she thought today's announcement would be Transcontinental's purchase of a struggling Chronicle Herald. "The Herald based its bargaining strategy on pleading poverty, yet even when we agreed to major concessions, it wasn't enough for them," said Martin O'Hanlon, president of CWA Canada, the national union that represents the HTU, in a news release. "Are we still in limbo? What are the legalities of it? Have they been bargaining in bad faith all along? If they had intended on acquiring such a large portion of the Atlantic provinces' other newspapers, how could they possibly say they needed all the concessions from us?" said Bulmer. "At some point they're going to have to sit down across from us and make a deal." Lever said today's acquisition is "completely separate" from the ongoing dispute with striking journalists at the Chronicle Herald. "Where the two connect are that this deal and the offer that we've provided the striking employees are about our future, trying to provide something that is sustainable and doable for the long term, as opposed to giving in to their demands. It would be a cheque that we couldn't cash," said Lever. "I hope that they will see this as an opportunity, they come back to work for a bigger organization with a better chance of success going forward and understand that the offer that we're offering is a fair one. "It is the fairest offer in the industry in Atlantic Canada. I can say that today with tremendous certainty." Bulmer said the union is consulting legal experts on how to proceed. Lever said the Chronicle Herald's circulation has seen a steady decline over the past 20 years, with daily circulation around 70,000, more on weekends. He said as a "direct result" of the strike, the paper lost at least 1,000 subscriptions. Transcontinental has sold a number of assets in the last few years. The sale leaves Transcontinental with 99 local and weekly newspapers in Quebec and one in Cornwall, Ont. The Advertiser, Grand Falls-Windsor, N.L. The Annapolis Valley Register, N.S. The Citizen Record, Amherst, N.S. The Gulf News, Port aux Basques, N.L. The News, New Glasgow, N.S. The Northern Pen, St. Anthony, N.L. The Queens County Advance, N.S. The Southern Gazette, Marystown, N.L. The Western Star, Corner Brook, N.L. The www.novanewsnow.com website (digital-only) is also included in the transaction. The Canadian Media Guild, which represents many CBC News employees, belongs to the same parent union as the striking Herald employees, CWA Canada.